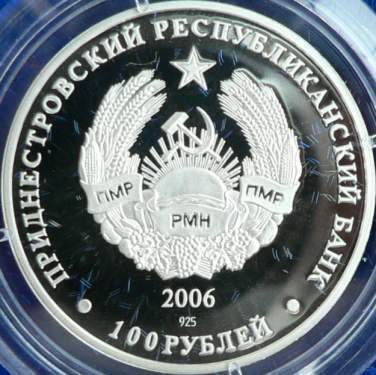 This coin belongs to the Fauna of Transnistria series, that comprises the following 100 rubles silver coins: hoopoe (2003), roe deer (2004), griffon vulture (Gyps fulvus, 2005), swallowtail (Papilio machaon, 2006) and stag beetle (Lucanus cervus, 2006). 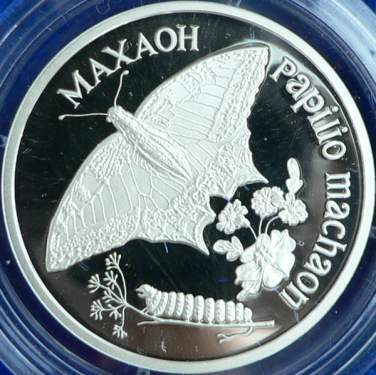 In Romania the butterfly on the coin is present in all areas of the country, being almost common at all altitudes and at all forms of relief. The machaon swallowtail belongs to Insecta class, Lepidoptera order (butterflies), Papilionidae family (swallowtail butterflies). Mentioned in a book from 1592, it was named Papilio machaon by the Swedish scientist Karl von Linné (or Linnaeus in Latin) in 1757, in the fundamental book "Systema Naturae". 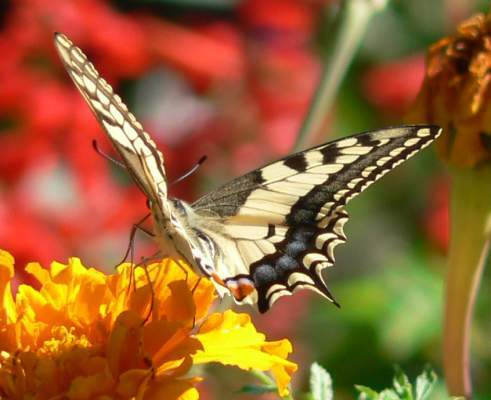 Papilio machaon is a large butterfly, having a wingspan of 5-9 centimeters. The caterpillar lives on umbelliferous plants, mainly on wild carrot (Daucus carota, a very common biennial weed from the umbel family - on the coin, the larva is sitting on such a carrot stem). Full-grown, the caterpillar is green-yellowish, with black stripes and reddish dots. Usually, the male is smaller than the female. In this country there are two annual generations, one in April-May and one in July-August. The butterflies from the second generation are larger that the ones from the first generation. The forewings are yellow, with black spots and stripes. The posterior wings have a characteristic tail-like extension, from which the popular name of the butterfly - swallowtail - is derived. The hindwings are yellow with black too, having a reddish spot near the tail and a series of blue spots on the wing border. Papilio machaon has a quick flight. It can glide with grace on the air, holding the wings horizontally. Machaon and Podalirius were sons of god Asclepius, the founder and patron of medicine, identified by the Romans with Aesculapius. Both brothers have participated to the Trojan War, being the best known medics of the Greek army. Linné gave the names Machaon and Podalirius to two swallowtail butterfly species.